Admittedly, this version from Cook’s Illustrated is not as divine as Thali’s. But it’s still delicious, and I’m thrilled to have found a recipe that I can recreate at home. I’ve noticed that some of CI’s recipes are a bit bland for my tastes, and I can’t help but wonder if it’s due to their by committee adjusting of recipes. Too many cooks spoil the broth, I think, or in this case, render it boring. As such, the amount of garam masala they recommended was not enough, so I nearly doubled the proportions. Of course, the garam masala itself was terrific; I’m fortunate to have a top notch spice company right here in town — the Canandaigua Spice Co. — where I could pick some up, hand-blended. I tried to reduce the fat a bit by using less oil, substituting whole plain yogurt for fat free Greek yogurt, and swapping the cream for buttermilk. Yes, not using cream did change the consistency of the sauce; it was less, well, creamy — but still very good. By all means, use the full fat versions of everything if you like. 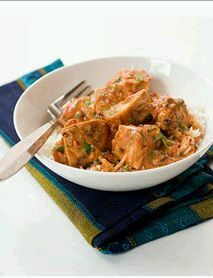 The recipe calls for serving the tikka masala over basamati rice but we used brown rice to get some more whole grains into our diet. For the chicken, combine cumin, coriander, cayenne, and salt in small bowl. Sprinkle both sides of chicken with spice mixture, pressing gently so mixture adheres. Place chicken on plate, cover with plastic wrap, and refrigerate for 30 to 60 minutes. In large bowl, whisk together yogurt, oil, garlic, and ginger; set aside. For the sauce, heat oil in large Dutch oven over medium heat until shimmering. Add onion and cook, stirring frequently, until light golden, 8 to 10 minutes. 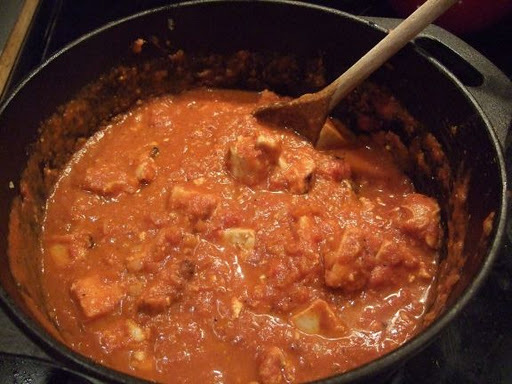 Add garlic, ginger, chile, tomato paste, and garam masala; cook, stirring frequently, until fragrant, about 3 minutes. Add crushed tomatoes, sugar, and salt; bring to boil. Reduce heat to medium-low, cover, and simmer for 15 minutes, stirring occasionally. Stir in cream and return to simmer. Remove pan from heat and cover to keep warm. While sauce simmers, adjust oven rack to upper-middle position (about 6 inches from heating element) and heat broiler. Cover chicken with yogurt mixture thickly and arrange on wire rack set in foil-lined rimmed baking sheet or broiler pan. Discard excess yogurt mixture. Broil chicken until thickest parts register 160 degrees on instant-read thermometer and exterior is lightly charred in spots, 10 to 18 minutes, flipping chicken halfway through cooking. Let chicken rest 5 minutes, then cut into 1-inch chunks and stir into warm sauce (do not simmer chicken in sauce). Stir in cilantro if using, adjust seasoning with salt, and serve.